The Multiple Talented Act, Teezkid, Join The New Elected Governor Of Osun State, Mr. Gboyega Oyetola, Also Know As "IleriOluwa" In Victory Celebration Of Just Concluded Election, In The State, Which Was At His Favour. 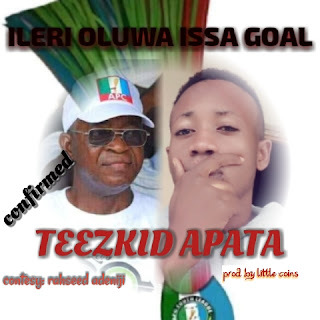 And This Ambitious Act, "Teezkid Return To Studio To Boil Up An Hot Track For Him, And He Entitled This One "Ilerioluwa Issa Goal", Produced By Little Coin. The Boy Killed The Song, Download And Feel The Hit. Ensure You Share This With Your People.